Considering that "disasters are inevitable in Bangladesh due to its high vulnerability index", the Government, specifically the Ministry of Disaster Management and Relief (MoDMR), recognized the need for strategic options to further reduce the impacts of disaster. The principle of "build back better" is one particular option that the Government wants to promote by seizing the opportunity to correct the limitations and failures of previous practices, policies, and programs during the recovery phase. It further recognized that recovery offers opportunity to make infrastructures, communities, and livelihoods resilient. 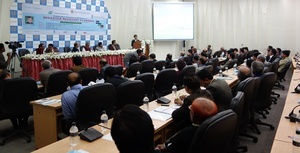 In view of this, the MoDMR, in cooperation with the Institute of Strategic Recovery Studies for Disaster Resilience and Research (ISRSDRR) and the Interational Recovery Platform/Asian Disaster Reduction Center (IRP/ADRC), had jointly organized a Stakeholders Consultation Workshop on Disaster Recovery Planning, 9-10 December 2014 at CIRDAP Auditorium in Dhaka, Bangladesh. The workshop was supported by local partners, namely: UNDP, Australian Aid, Islamic Relief, and Christian Aid. Participated by over 50 stakeholder representatives, the consultation was generally aimed at creating the foundation for promoting resilient recovery and paving the way for sustainable development in Bangladesh. Specifically, the consultation was expected to achieve the following: (i) introduced recovery agenda to key stakeholders, (ii) prepared the ground works for establishing a National Recovery Platform, and (iii) discussed and endorsed a Roadmap for Disaster Recovery Planning. At the opening, IRP/ADRC delivered the keynote speech which introduced the key principles of disaster recovery, including knowledge products, case studies, tools, and guidance. After the keynote, the following key officials from the Government delivered their respective speeches: Mr. Mohammed Abdul Wazed, Director-General of the Department of Disaster Management; Dr. Mesbah ul Alam, Secretary of the Ministry of Disaster Management and Relief; Hon. Mofazzal Hossain Chowdhury Maya Bir Bikram, Minister of Disaster Management and Relief; and Mr. Dhirendra Debnath Shambhuh, Member of Parliament and Chairman of the Parliamentary Standing Committee on Disaster Risk Reduction. The key message of all the speeches was that recovery is gap in disaster risk reduction (DRR) that Bangladesh needs to address. At the end of the workshop, the stakeholders identified the following key recommendations: (i) institutionalization of recovery functions at the national and local governments; (ii) establishment of predictable funding for recovery at the government agencies; (iii) adoption of mechanisms for cooperation in areas of recovery; and (iv) formulation of disaster recovery framework for readiness and capacity. As way forward, the Ministry of Disaster Management and Relief laid the ground works for establishing the National Recovery Platform with further consultations with key stakeholders, including UNDP, Islamic Relief, Christian, ISRSDRR, and IRP/ADRC.